There's been a rash of news stories recently with headlines so misleading it's hard to believe they passed editorial muster. Yet a quick search of Google News reveals no less than five articles with ledes very much like this one: "P&G to cut 1600 staff after CEO discovers digital media is free". Any serious marketer knows "free" is nonsense. As with SEO, content marketing shakes marketers loose from the expense of the media buy. But budgets, staffing, skill sets, education, agency relationships, investments in technology and shifting strategy to align content with other marketing initiatives (yes, even advertising) all require substantial investment, and require marketers to rebalance both strategies and tactics. That's what Content: The New Marketing Equation examines. Following on the heels of my book on content marketing, which looks at why content marketing matters, this research report examines how organizations are adapting to the challenges it presents: the need to think like a publisher rather than an advertiser; moving from episodic campaigns to sustained content initiatives; and creating a genuine culture of content throughout the organization because stories don't reside in the marketing department. 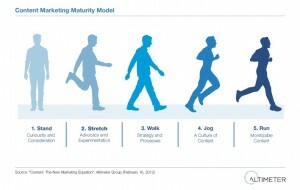 The report identifies the five stages of maturity an organization can achieve as it becomes more proficient at content marketing, including a self-assessment tool to score your own level of content proficiency. We also look at the content channels marketers are using now, and those they say they will in the future. As they move away from text-based channels, e.g. articles and blogging, into more technologically sophisticated areas such as video, mobile and image-based information, it's clear "free" does not enter into the equation. For the report, we conducted 56 interviews with subject matter experts and companies as diverse as Coca-Cola, American Express, GE, IBM, Adobe, Ford Motor Company, Wells Fargo, and Intel. Below, the questions we asked each interview subject. Have you run into any problems with outsourcing content creation to agencies? Have they been able to effectively align the content they create with your brand ? Can – and should - content marketing initiatives be reconciled and integrated with advertising? What are the most effective types of content you've used to promote your brand? How should organizations rebalance? How should internal and external resources be aligned? How do they integrate silos for more effective messaging and spend? Have you needed to hire new employees or create new teams? How many did you have to bring on? Which teams did you have to create? What drove you to the conclusion that this rebalancing was necessary? Where are these new resources coming from? Should they be assigned to the same agency that handles advertising? Outsourced to PR firms, digital consultancies – or staffed in-house? Can they – and should they – be integrated with or otherwise reconciled with “classic” advertising? How are internal staffing needs changing? How much content creation can realistically be outsourced – does this lead to a “clueless handler” situation? How are determinations being made regarding when it’s better to buy vs. create or earn media? Who ultimately makes that decision? How do you determine the optimal mix between bought vs earned media? What qualities do you look for when evaluating these agencies? What are the most common 'red flags' you look for when deciding to work with an agency? How do you get management buy-in and measure content marketing initiatives? What new types of content do you anticipate adding to your arsenal in the next year? Three years out? Which types of content do you plan to phase out or found ineffective? How is your organization adapting its structure to accommodate content marketing? Are there any questions that you wish we had asked you/we should have asked? And who else do you think we should speak to for this research report? Many thanks to the numerous people who tirelessly contributed their time, knowledge and expertise to making this research happen. We'd be delighted to hear your reactions and to provide direction or guidance on your own content marketing or strategy needs.